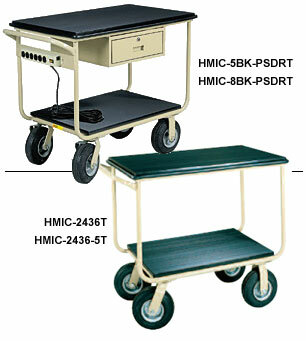 Ideally suited for transporting delicate or sensitive equipment. Superior construction features for long life -- handle 1000 lb. loads. Non-conductive wood composite shelves feature non-slip, cushioned vinyl surfaces with non-marking, full perimeter bumper around top shelf. Choice of 9" pneumatic casters for air-cushioned transport or 5" non-marking polyurethane casters with wheel brakes. Beige enamel finish. FOB Shipping Point. W x L x H Wt. (lbs.) Price Ea.